Crappie are, in my opinion, one of the most fun fish to catch and certainly one of the best tasting fish. They swim in large schools and are found throughout most of the U.S. and into Canada. Crappie prefer fairly warm water and are normally found in nearly all types of cover. They average 6-11" fully grown, however with enough food and cover they can reach lengths up to 17". A large crappie is referred to as a "Slab". In most waters, crappie with a weight of 1/2 to 1 pound are considered good fish. In other waters, crappie are not considered large until they hit the 1 1/2 or 2 pound mark. They can, under ideal circumstances, reach weights of up to 6 pounds. There are two sub-species to the common crappie. 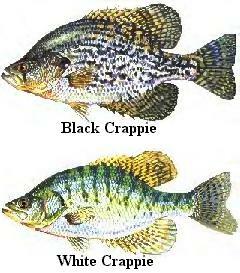 The black crappie, which gets its name from its slightly darker appearance, and the white crappie. The black crappie is usually white or gray with dark gray or black spots covering most of its sides. It has 7-8 dorsal spines on the top of its back. The white crappie tends to be lighter in color and often has distinct vertical bars of gray extending down its sides. It has 5-6 dorsal spines. Both of the sub-species have nearly the same feeding patterns and spawning time. I have heard the black crappie prefers clearer water, where the white crappie tolerates muddier water better. They are both terrific in the pan, I might add. 1. Maribou Jigs- These are the small jigs that have little furry bodies and puffy, feathery tails. They come in many sizes and tons of colors are very durable, and are fairly cheap to buy (I catch them on sale at Wal-Mart for $.25 for a four-pack). They can also be easily made at home with some yarn and pipe cleaners. These jigs are perfect for finesse fishing picky crappie, vertical jigging over structure, or suspending under a bobber. I prefer a 1/16 or 1/32 oz. jig. When choosing a color, I follow the table below. 2. Curly-tail Grubs- These are the soft plastic baits that have curly tails on the back that produce lots of action when jigged or retrieved steadily. They come in many sizes, but I like a 1 1/2"- 2 1/2" grub for crappie. Rig them with a 1/8- 1/64 oz. jig head, depending on conditions and preference. Follow chart below to choose a color. A. Small Willow Leaf Blade- This is a very effective type of blade and seems to work well on most species. Try rigging it with a 2" tube bait or curly tail. B. Small Silver Colorado (circular) Blade- This blade type produces a lot of vibrations and can be fished very slowly. Rig with 2" tube bait or, for even more action, add a curly tail to it. This combo is great for very stained, dark water. C. Small Gold Blade- My Favorite! A tiny, gold, Colorado blade with a 1/32 oz. jig head and a hot-colored, 2" tube bait is a dynamite lure for nearly any freshwater species. I suggest going to Wal-Mart and picking up a 2-pack of these tiny gold spinners. You will be glad you did! D. Beetle Spin- These come in tons of colors, sizes, and brands, but they have never let me down. The 1/8 and 1/16 oz. sizes are perfect for crappie as well as other fish. They are also a good choice. Clear Water: In clear and lightly stained waters, the most important thing to remember is to match the natural food items. When fishing with a minnow type lure, such as a tube bait or a shad shaped lure, try to use natural looking colors such as silver, smoke, gray, etc. When jigging near or on the bottom, try using browns or dark greens. Dark/ Stained Water: In stained or muddy waters, the keys to attracting strikes are vibration and brightness. Because dark water filters out much of the sunlight, often the best fishing is during mid-day or bright sunlight times. The fish can see better with more light penetrating. Vibrations also thoroughly help crappie to find forage in dark water, so a lure that produces these is usually a plus. Spinners, grubs, and jigs that are kept moving are usually good choices. Choose bright colors! Try using chartreuse, hot pink, white, yellow, hot green, etc. Sparkles are also good. Cloudy Days: Cloudy, overcast days limit the amount of sunlight that reaches the fish. Try using colors that are slightly darker than you would normally use. Browns, greens, and even black are good colors to try on cloudy days. One of my personal favorites is a 2" black curly-tail grub with a yellow or chartreuse tail. The fish seen to pick up the combination of light and dark very well. I also use a small gold spinner with this grub. Bright Sunlight: Sunny days are usually fairly simple days to choose a lure color. Try the brightest color you have first. Chartreuse, white, yellow, and hot pinks and greens are favorites of mine. Try small silver or gold spinners to produce extra flash as well. Night Fishing: Crappie fishing at night is said to be quite productive, though I have never tried. Because of the lack of light at night, try jet black lures, or combinations of black and other colors. Try following these basic guidelines the next time you are choosing a lure and color and I think you will be pleased. However, remember this is just a guideline. If these techniques do not produce fish, try something totally different. Crappie are fairly active year round, but fall and spring offer the hottest fishing. The warming spring water temperatures triggers a feed-a-thon amongst fish. Crappie spawn when the water temperature reaches about 52-60 degrees. Just before spawning (when the water hits about 48-51 degrees), they move into shallower water and feed aggressively. This is known as the pre-spawn period. Most crappie move into shoreline cover such as fallen trees and shallow coves during this time. The females will then lay their eggs and move to slightly deeper water while the males stay in the shallows and guard the nest. If you catch several smaller fish in shallow water, try moving to the nearest drop-off and you may find the larger females feeding. These pre-spawn and spawn periods of spring often offer the best fishing of the year. The cooling water of the fall also offers good crappie fishing. When the warm summer waters begin to cool down, the fish begin feeding aggressively in order to fatten up for the winter. Schools of big slabs can be caught easily during this "fall feed-up". Crappie are fish that love structure, so key in on areas with prominent cover. Rock piles, shallow coves, stumps, points, fallen trees, and submerged brush are all favorites. Many anglers sink Christmas trees, old bushes, tires, and even wooden palettes to create homes for big fish. Vertical jigging is a good method to fish submerged cover. A 1/32 or 1/16 oz. jig dropped into brush and twitched will produce many fish if the conditions are right. Try swimming a small spinner through stump fields or along fallen trees to locate the slabs. When you identify the depth at which most of the fish are holding, try suspending a jig or minnow at that depth under a small bobber. This is an effective way to keep your bait in the desired depth for a much longer period of time.